the shape and angles to which the cutting portion of a cutting tool are ground. It influences the type of machining process for materials, the efficiency and economy, the quality of the finished part, and the life of the cutting tool (the operating time up to normal dullness). All the definitions cited below apply to other cutting instruments (drills, broaches, and milling cutters). The cutting portion consists of the working surfaces (see Figure 1): the top surface (face), along which the chip formed in the machining process comes off; and the side relief and end relief surfaces, which face the machined surface of the workpiece. The intersections of the working surfaces form the cutting edges. The side-cutting edge, which performs the principal work during machining, is formed by the intersection of the top and the side relief surfaces; the end-cutting edge is formed by the intersection of the side relief and end relief surfaces. The point at which the side- and end-cutting edges converge is called the tool point, or nose. It is the weakest part of the tool and determines the overall strength of the cutting edge; consequently, in order to increase its strength, the tool point is given a cutting edge that is circular (with a radius of 0.5-2 mm) or is in the form of a transitional cutting edge (0.5-3 mm long). The elements of the cutting portion of a cutting tool are subdivided into the static, which determine the angles to which the tool is ground, and the kinematic, which depend on the type of the machining process and on the cutting-tool device. The grinding angles determine the shape of the cutting portion during the design, fabrication, and inspection of a cutting tool. It is shaped like a wedge that is ground to specified angles. Two coordinate planes—the machining plane and the base plane—are established in order to determine the angles. The machining plane is tangent to the machined surface and passes through the side-cutting edge. The base plane is parallel to the longitudinal and transverse feeds of the cutting tool (parallel and perpendicular, respectively, to the axis of the workpiece). These coordinate planes are perpendicular to each other. 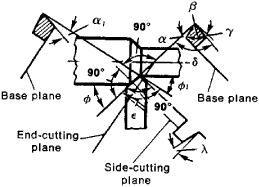 The side angles of the cutting tool are determined in the side cutting plane, which is perpendicular to the projection of the side-cutting edge on the base plane (see Figure 2). The side relief angle α is the angle between the side relief surface of the tool and the machining plane. In choosing a relief angle, the rate of feed is taken into account to avoid friction between the relief surface of the tool and the machined and cutting surfaces: the larger the feed, the larger the relief angle. The lip angle β is the angle between the top and the side relief surfaces of the tool. The side rake angle γ is the angle between the top surface of the tool and the plane perpendicular to the cutting plane. The choice of the rake angle depends primarily on the physicomechanical properties of the material being machined. The larger the rake angle, the easier the process of formation of chips, the lower the cutting force, and the lower the power consumed. The greater the hardness of the machined material, the smaller the rake angles used for the cutting tool during machining. The cutting angle δ is the angle between the top surface of the tool and the cutting plane. The primary angle in the plane Ø is the angle between the feed direction and the projection of the side-cutting edge on the base plane; the secondary angle in the plane Ø1 is the angle between the feed direction and the projection of the end-cutting edge on the base plane. The angles Ø and Ø1 determine on the one hand the operating conditions of the cutting edge and on the other hand the distribution of the load from the cutting forces. The smaller the angle in the plane, the lower the thermal and force loadings per unit length of the side-cutting edge (at constant feed and depth of cut), and therefore the better the operating conditions. Reducing the angle in the plane below the optimal value may result in excessive deformation of the workpiece being machined, less accurate machining, and vibrations. The nose angle Ɛ is the angle between the projections of the cutting edges on the base plane: Ɛ = 180° - (Ø + Ø1). The angle in the plane of the transition (straight-line) cutting edge Ø0 is the angle between the feed direction and the projection of the chamfered cutting edge on the base plane; usually Ø0 = Ø/2. The rake angle λ of the side-cutting edge is the angle between the cutting edge and the line drawn through the nose of the cutting tool parallel to the base plane; λ is positive when the nose of the tool is the lowest point of the cutting edge, it is negative when the nose is the highest point, and is zero when the side-cutting edge is parallel to the base plane. It affects the direction in which the chip comes off. The standard geometry of a cutting tool forces the dust back up, directly into the path of the cutting tool, thereby creating significant unnecessary damage to the tool itself," Alster said.